Someone asked me what are the current top scores of the latest "Toy Box" so here it is. "Purple Dream" is using iPhone 4 while I'm using iPhone 3G (waiting for the new iPhone), so our "perfect scores" may be different. It's just a coincidence that our scores for this box and "Valentine Box" are very similar. Based on the scores we're getting for "Cardboard Box", which is the easiest box to aim for "perfect score", the gameplay for both iPhone 3G and iPhone 4 is still the same as last time (both devices still have the same differences like last time). Last time in vers. 1.1 to 1.3, the "Best Score" for the "Cardboard Box" was 141,770 pts for iPhone 3G and 141,650 pts for iPhone 4. In ver. 1.4, the total score achievable for the "Cardboard Box" has been increased due to some changes in the level designs. In Level 1-21, the position of 1 star has been changed while in Level 1-23, the positions of the candy and bubble have been changed slightly (read my next post for more details). 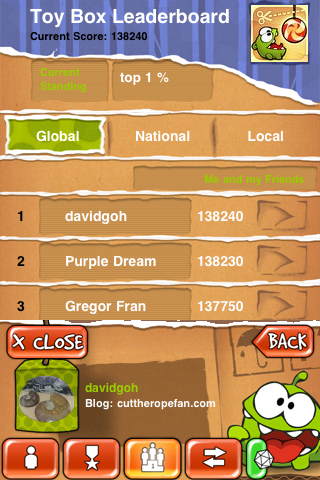 (1) 141,790 pts using iPhone 3G ("davidgoh"). (2) 141,680 pts (true when article was written) using iPhone 4 ("Purple Dream" and "Kopalexis"). For some boxes like "Cardboard Box", iPhone 3G has an advantage over iPhone 4/4S but for others like "Magic Box" and "Cut The Rope: Holiday Gift", iPhone 4/4S has an advantage, etc. We have to use different tricks and methods in some levels and even when playing in the same way we can get different scores. When you compare iPhone 3G with iPhone 4/4S, iPhone 3G has a slight advantage of 10 pts or more when dealing with bubbles because bubbles rise up faster, while iPhone 4/4S has more "springy" ropes and Om Nom can stretch open its mouth slightly wider. So certain tricks and techniques can only work in certain devices. It seems iPhone 3G has advantages on Toy Box. As the bubbles rise faster on iPhone 3G than iPhone 4, you can get higher scores on some levels. 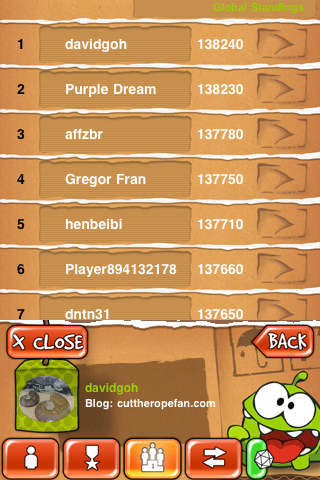 For example, the best score on Level 8-2 on iPhone 4 is 5600, while the best score on iPhone 3G is 5620 or 5630. And it seems no menthods only achievable on iPhone 4 on this box, so the best scores on iPhone 3G are higher than on iPhone 4. Perhaps you missed some faster menthods or didn't do the best on some levels. For this box, iPhone 3G may have a slight advantage over iPhone 4 like what you said (for 8-2 I got 5620 pts). iPhone 3G has advantage when dealing with bubbles but iPhone 4 has more powerful air cushions and more "springy" ropes. The rebounding forces (from the tightened ropes and the rebounding platforms) are greater in iPhone 4 I think, so the candy may move faster when it rebounds. This is based on the observation that for levels like 1-2 and 1-24 in "Cut The Rope", and the Level 18 in "Cut The Rope:Holiday Gift", iPhone 4 can get higher scores than iPhone 3G when playing in the same way. The iPhone 3G best scores for 1-2 and 1-24 in "Cut The Rope" are 5610 and 5920, for iPhone 4 they're 10 pts higher at 5620 and 5930 respectively. For the Level 18 of "Holiday" box, the difference is 40 pts or more, for iPhone 3G the best score is 5740 and for iPhone 4, "dntn31" got 5780 (you may get the same or higher). Besides these, I notice that in the "Valentine Box", for some levels where you have to swing the candy and let it rebound from tightened ropes, my best scores are about 10 pts lower (ibulae and you posted some scores when I read the forum posts last time). Overall I think iPhone 3G still has a slight advantage in this box than iPhone 4. My scores are only near-perfect but I think I can only add a little more. "dntn31" uses both iPhone 3G and iPhone 4 to play and if you look at his scores, you would know that I've tried hard to match your scores. I was hoping that ZeptoLab would calibrate properly for ALL devices (at least for all kinds of iOS devices including iPhone, iPod Touch and iPad) so that next time when we upgrade to iPhone 5, etc. we don't have such problems again. So, I recently started high scoring this game and I have managed to get a score of 141,690 on the cardboard box using an iPhone 4. I suspect that Purple Dream and Kopalexis are missing 10 points on either 1-18, where I have 5,800 or on 1-23, where I have 5,620. Could also be due to a difference in v1.4 and v1.5, dunno. Raif, can you confirm whether you're using the new iPhone 4S or the old iPhone 4 ? I still haven't got my iPhone 4S yet and last time I didn't upgrade to iPhone 4. Even for iPhone 4, there're 2 versions; the older type and the new "white" iPhone 4. Can you specify the exact iPhone type you have ? I'll write an article on this now. The old one. An iPhone 4 GSM 16GB Black, to be exact. I can also confirm that the gameplay for Cut The Rope HD on iPad (1st Gen) is pretty much the same as iPhone 4, atleast for the Cardboard Box. (1) There's not much difference when you compare the blowing strength of the air cushions. Sometimes iPhone 3G can't perform the iPhone 4/4S tricks because the ropes are more "springy" and Om Nom's mouth is slightly wider in iPhone 4/4S than iPhone 3G. (2) Please ignore my above comments on the score difference for Level 18 of the "Holiday" Box (between iPhone 3G and iPhone 4) because when I just replayed this level using iPhone 3G and iPhone 4S in the newly released "Cut The Rope:Holiday Gift" ver. 1.1, I discovered that I can get very similar scores now.